Most people have never heard of a signature block. We certainly hadn't before we started doing all this legal stuff! 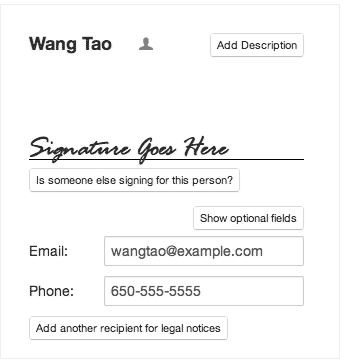 A signature block is the text surrounding a signature, that gives that signature context and provides additional information. Signature blocks often contain the name of the party, the names and titles of people (either entities or human beings) signing on behalf of that party, and contact information for that party. 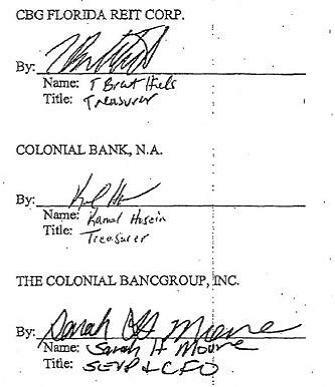 There's three signature blocks on this page - one for CBG Florida REIT Corp., one for Colonial Bank, N.A., and one for The Colonial Bancgroup. Inc. In this example, all of them have the name and title of a human being that is signing on behalf of each party.